Successive magma batches underplate, ascend, stall and erupt along spreading ridges, building the oceanic crust. It is therefore important to understand the processes and conditions under which magma differentiates at mid ocean ridges. Although fractional crystallization is considered to be the dominant mechanism for magma differentiation, open-system igneous complexes also experience Melting-Assimilation-Storage-Hybridization (MASH, Hildreth and Moorbath, 1988) processes. 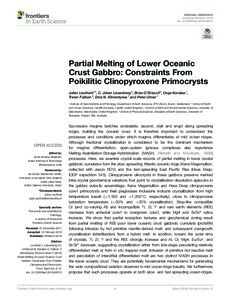 Here, we examine crystal-scale records of partial melting in lower crustal gabbroic cumulates from the slow-spreading Atlantic oceanic ridge (Kane Megamullion; collected with Jason ROV) and the fast-spreading East Pacific Rise (Hess Deep; IODP expedition 345). Clinopyroxene oikocrysts in these gabbros preserve marked intra-crystal geochemical variations that point to crystallization-dissolution episodes in the gabbro eutectic assemblage. Kane Megamullion and Hess Deep clinopyroxene core1 primocrysts and their plagioclase inclusions indicate crystallization from high temperature basalt (>1,160 and >1,200°C, respectively), close to clinopyroxene saturation temperature (<50% and <25% crystallization). Step-like compatible Cr (and co-varying Al) and incompatible Ti, Zr, Y and rare earth elements (REE) decrease from anhedral core1 to overgrown core2, while Mg# and Sr/Sr* ratios increase. We show that partial resorption textures and geochemical zoning result from partial melting of REE-poor lower oceanic crust gabbroic cumulate (protolith) following intrusion by hot primitive mantle-derived melt, and subsequent overgrowth crystallization (refertilization) from a hybrid melt. In addition, toward the outer rims of crystals, Ti, Zr, Y and the REE strongly increase and Al, Cr, Mg#, Eu/Eu*, and Sr/Sr* decrease, suggesting crystallization either from late-stage percolating relatively differentiated melt or from in situ trapped melt. Intrusion of primitive hot reactive melt and percolation of interstitial differentiated melt are two distinct MASH processes in the lower oceanic crust. They are potentially fundamental mechanisms for generating the wide compositional variation observed in mid-ocean ridge basalts. We furthermore propose that such processes operate at both slow- and fast-spreading ocean ridges. Thermal numerical modeling shows that the degree of lower crustal partial melting at slow-spreading ridges can locally increase up to 50%, but the overall crustal melt volume is low (less than ca. 5% of total mantle-derived and crustal melts; ca. 20% in fast-spreading ridges).